Hogwarts’ most diligent student, Hermione Granger, joined the action in LEGO Dimensions on May 9 with the arrival of a brand new Harry Potter Fun Pack! 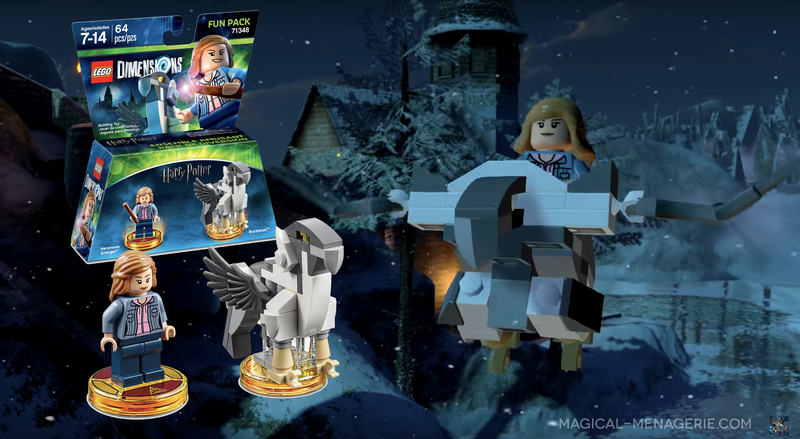 The Fun Pack features a Hermione minifigure with all new enhancements, including Wingardium Leviosa & Lumos. You can order the fun pack for $11.99 at Amazon, Target, Best Buy and Toys R Us! Hermione will reunite with Harry and Ron for the first time in the game to explore locations in Hogwarts, Hogsmeade and Diagon Alley. Buckbeak will join Hermione in the Fun Pack as an epic, rideable character. The Fun Pack will also unlock the Harry Potter Battle Arena for fans to play any of the four Battle Modes. Warner Bros. Entertainment sent us the Hermione and Buckbeak fun pack as well as a LEGO Dimensions starter pack so we could test out the character! You start off by making sure you’ve downloaded the Harry Potter character update, building Hermione and putting her on the game pad. Then directions to build Buckbeak will appear on your screen and guide you through the process. After you build him you can start to play! Since we don’t have and other Potter characters at the moment we played with Batman, Gandalf and Wyldstyle to defeat the Wicked Witch. View more photos of the experience on our Facebook page, don’t forget to like us! Thanks to WB for sending the product for us to test out.